Of all types of vehicle accidents, there is no doubt that truck accidents are the most terrifying. Weighing up to 80,000 lbs., when a large truck hits another vehicle, the damage can be catastrophic. At The Law Offices of Alan Hildreth King & Associates, our Revere truck accident lawyer understands how painful the aftermath of a truck accident can be, and is committed to working hard for you. It is important that you bring forth your truck accident claim within three years of the date of the accident. If not, Massachusetts’ law prevents you from recovering damages. Keep in mind that some of the blame for the truck accident could also be pinned on you. If this is the case, Massachusetts’ laws of comparative negligence state that your recoverable damages amount will be reduced in proportion to your degree of fault. 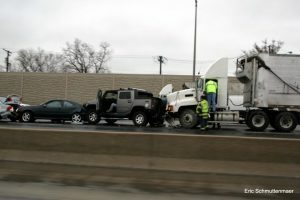 Trucking accidents typically leave victims with severe injuries, including crush injuries, traumatic brain injuries, spinal cord injuries, and amputation injuries. If you have suffered serious injuries, you may be unable to investigate your crash and begin the legal process on your own. As such, we urge you to contact us immediately. We can travel to your location to discuss your case in more detail. We will also open an investigation on your behalf, and hire the experts necessary to build your case. We handle all aspects of your truck accident claim for you so that you can focus on what’s important: your recovery. If you have lost a loved one in a truck accident, we can also represent you and your family in the filing of a wrongful death claim. Truck accidents are terrifying, but when you call our law firm, you are improving your chances of a better future. At The Law Offices of Alan Hildreth King & Associates, our Revere truck accident attorneys care about you, and has the legal acumen and experience you’re looking for. Reach us today to schedule your free consultation by phone or online.